Java is the most popular programming language in the world, so there are many libraries to support your development. A quick Google search should tell you if a Java library exists for what you are trying to do; this is how we found the library Twitter4J. For the rest of this blog entry, a basic understanding of programming in Java is helpful, but not necessary. The most common way to compile Java code is to use an integrated development environment (IDE). For this article, I will use Java IDE Eclipse, version Oxygen. Even if you have a different version of Eclipse, the steps should be similar. You can download the latest version of Eclipse from the below URL if you would like to follow this example. 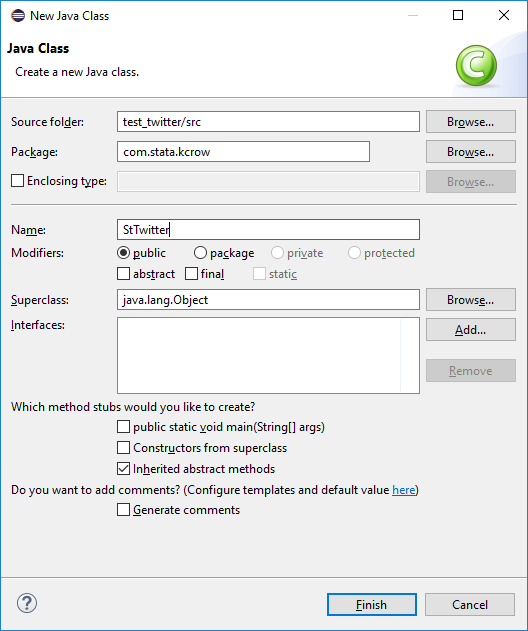 After downloading and installing Eclipse, you will need to download the Java library twitter4j to interact with Twitter’s API. 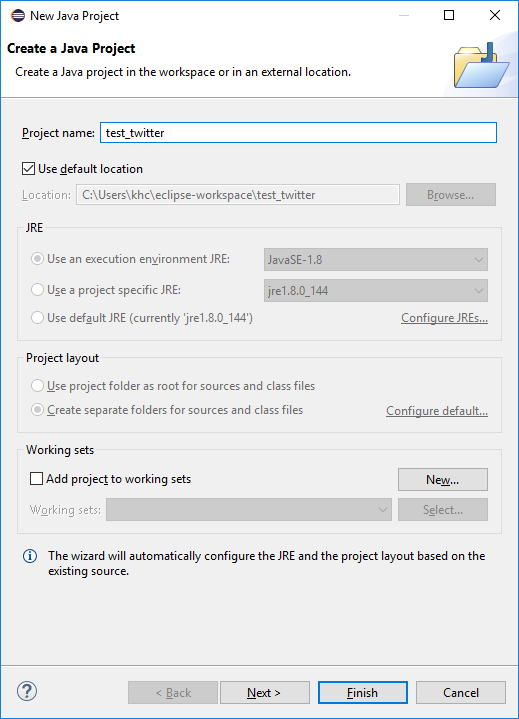 To start, we must create a Project in Eclipse by opening Eclipse, going to the File menu, and selecting New->Java Project. You should now see the New Java Project dialog. I named my project test_twitter, but you can name your anything you like. Click the Finish button and you should now see your project name in the Package Explorer pane on the left-hand side of Eclipse. Now that we have our project, we need to add the twitter4J Java library and the Stata SFI library to it so that we can interact with Twitter’s API and Stata. To do this, unzip the file you downloaded from twitter4j.org. After you unzip the file, there should be a directory, lib, that contains the libraries we need. Remember this location. 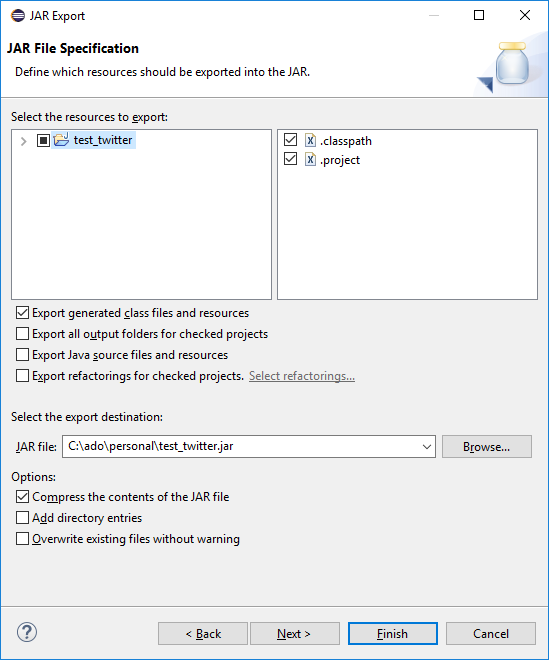 To add the twitter4J JAR files to our project, right-click on the test_twitter package name in the Package Explorer and select Properties. 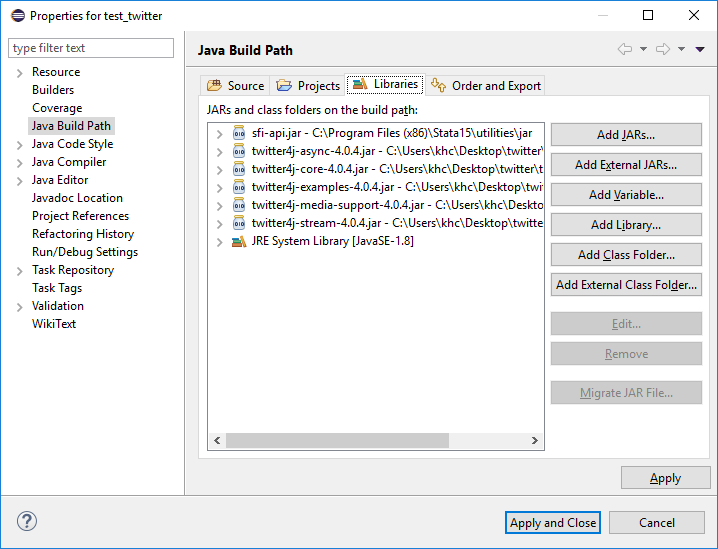 In the Properties dialog, select Java Build Path and click on the Libraries tab. Then, click on the Add External JARs… button to bring up the Jar Selection dialog. Browse to the lib directory where you unzipped the twitter4J JAR files, select all JAR files in the directory, and click the Open button. Find the file sfi-api.jar, select it, and then click the Open button. Last, in the Properties dialog, press the Apply and close button. When you add a class to a project, you must also name the package where the class is stored. A Java package is just a name space. When naming your package the Java standard is to use a URL as part of your package name space, which in my case is stata.com. You can name the package anything, but try and name it something unique to avoid Java package name collisions later on. To keep things simple, I named my package com.stata.kcrow. I named my class StTwitter. Click Finish to create your package and class. To test that we have everything set up correctly, let’s write a simple helloWorld (member) function in our StTwitter class to test the Stata SFI. You can copy and paste the below code into Eclipse code editor and then save the project. To use this function in Stata, we must export our code to a JAR file for Stata to read. 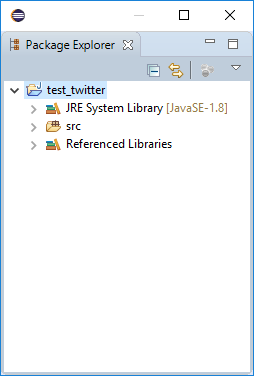 To do this, again right-click on the test_twitter package name in the Package Explorer and select Export. 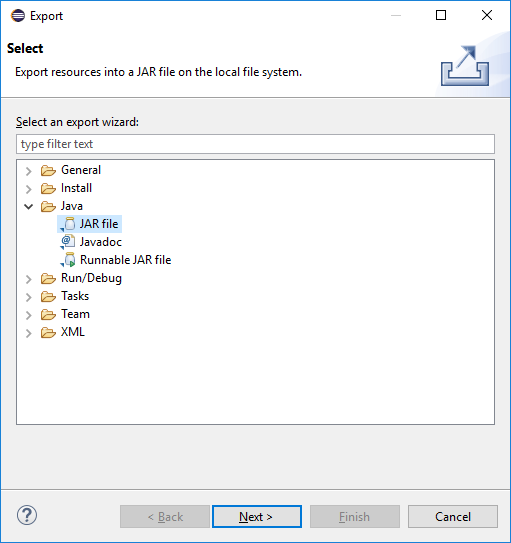 In the Export dialog, select Java->JAR file and then click Next. We should save the file in the PERSONAL directory in this case. Also, make sure the check box Export generated class files and resources is checked. Click the Finish button. in the Stata Command window. You can also wrap the javacall command in an ado-file to make it easier to call from Stata. For example, you can save the file twitter_test.ado, which contains the below code, along your ado-path. Now, to call our StTwitter class, we can type twitter_test in Stata. In my next post, I will focus on Twitter API authentication and searching tweets using twitter4j.